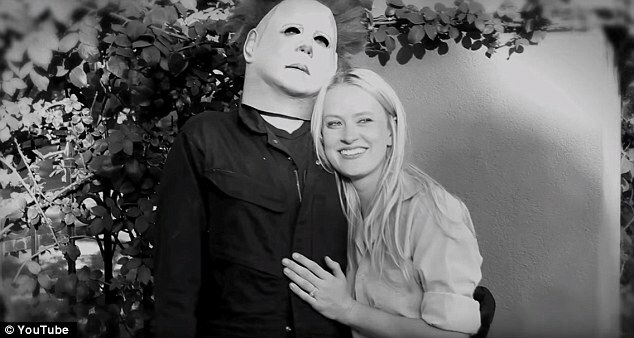 A Halloween movie fan has taken his love of Michael Myers to new heights by dressing as the infamous masked killer to first spook his girlfriend by re-enacting a scene from John Carpenter’s Halloween and then shock her even more by removing the mask and proposing to her. This is clear proof that Michael Myers may be the baddest fictional serial killer of all time, but he is also bringing people together. Alec Wells, 20, had friends record his proposal to his horror obsessed girlfriend, Katherine Canipe, 30, back on October 2014, which he then edited with actual clips from the film and uploaded to YouTube yesterday. Since the couple live in California near the South Pasadena neighborhood where Carpenter shot the original film, Wells lured his girlfriend to the street where some of our favorite scenes were filmed to give her one hell of a good scare. Watch the video the player below, and then tell us what you think in the comments!